President Bush returned to the White House on Friday after a whirlwind Asia-Pacific tour that took him to six nations in seven days. He ended the trip just as he began it: raising money for his own 2004 re-election campaign. In between, Mr. Bush flew to Japan, the Philippines, Thailand, Singapore, Indonesia and Australia, a distance of nearly 24,000 miles. "We had a great trip. I visited with some of our strongest allies in the war on terror and some of the nation's most important trading partners," the president told reporters before leaving Hawaii, his last stop before heading home. Back in Washington, Mr. Bush still has a few more miles to go. After a few hours at the White House, he is scheduled to helicopter to Camp David for the weekend. Earlier, while raising money for his re-election campaign, Mr. Bush said he believes his trip around the Pacific Rim contributed to progress on a broad agenda that will help make America more secure and prosperous. Mr. Bush stopped for 12 hours in Hawaii on Thursday, taking a tour of Pearl Harbor, visiting an elementary school, catching up on the World Series in his hotel room, meeting with Pacific Island leaders and attending a fund-raising dinner that added $600,000 to his campaign coffers. About 200 protesters lined sidewalks in front of the Waikiki hotel complex where the Bush-Cheney 2004 rally was held. "Hey, hey, ho, ho, George Bush has got to go," demonstrators chanted, waving signs with messages that included "Out of Iraq" and "Pre-emptive strikes fuel perpetual war." In his speech at the fund-raiser, the president prodded Congress to complete work on a Medicare prescription drug bill. "The sooner they get the job done, the sooner American seniors will get the health care they need," he said, to applause. Also while in Hawaii, the president issued a written rebuke to Senate Democrats who derailed Republican-backed legislation to limit class action lawsuits and large damage awards against corporations, apparently killing the bill for this year. "I am eager to sign it, our economy needs it and I urge those senators who stand in the way to let the will of the people be heard," he wrote. Thursday, the Bushes visited Pearl Harbor and the memorial for the sunken battleship USS Arizona, where 1,177 sailors and Marines died in the Dec. 7, 1941, Japanese attack, and where oil still bubbles up from the remains. As is traditional, Mr. Bush and Laura Bush, dropped flowers into the water. They also toured the decommissioned 45,000-ton battleship USS Missouri, where the World War II surrender documents were signed in Tokyo Bay, and took a boat tour of the harbor, passing ships and nuclear-powered submarines just back from the Iraq war. "You set a great example for future soldiers and sailors," the president told a group of about 60 World War II and Korean War veterans on the Missouri. 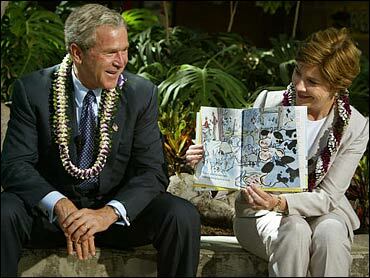 The Bushes also found time to visit Pearl Harbor Elementary School to read to second graders. As the Bushes entered, the students were asked if they knew who their visitors were. "George Washington," one shouted. Mr. Bush laughed. "You got the first name right," he said.